Latest BeeRaider news for its ergonomic, logical and compact keyboards. BeeRaider’s 2019 Spring Sale is now in progress. Go here (https://www.beeraider.com/products/) to avail of our big 25% discount on all our wireless keyboard products before this great offer ends on the 31st of March. BeeRaider is pleased to announce the appointment of its first distributor. A distribution agreement for the Netherlands was signed today between BeeRaider and the Netherlands based company called Babbage (www.babbage.com). Babbage is a leading company in its field providing technology and training that makes information accessible to people with physical and visual impairments. The agreement signing follows on from extensive in-house and in-field testing by Babbage of BeeRaider’s keyboard products and involved target customer testing. BeeRaider believes that the agreement represents a big endorsement of its uniquely designed and patented keyboard products and the real benefits to be realized by users who use them. Feedback to date shows that one-handed users are seeing sizeable increases in their ability to enter data with BeeRaider’s keyboards, especially the Optimized keyboard. It stands to reason that if one handed users can realize these benefits, then an able-bodied-user using two hands can expect to benefit even more from using our keyboards. In fact their increased data-input performance in relative terms will be even greater as their two hands will cover the keys of the keyboard layout much more effectively. This means less hand-movement. BeeRaider’s keyboards are designed to be used by both one and two handed users. BeeRaider’s 2019 New Year Sale is now in progress. Go here (https://www.beeraider.com/products/) to avail of our big 20% discount on all our wireless keyboard products before this great offer ends on January 31st. Here’s wishing all our customers a very happy and prosperous New Year! So here’s some good news for Christmas. We are always happy to receive feedback from our customers and even more so when they tell us how our Optimized keyboard has helped them to greatly improve their typing speed. Others with the use of only one hand have told us how our keyboards have helped them to continue to be able to use a computer effectively. It has also been suggested that even blind people could easily learn to use our Optimized keyboard as its layout is so easy to memorize. We at BeeRaider Keyboards are now more confident than ever that our Radial Keyboard design meets all expectations that were originally intended for this unique design. Our annual Christmas keyboard sale starts today and ends December 25th. So get yourself a nice 15% price discount by placing your order now. Click the link below to order your keyboard for Christmas. Note that late orders may mean delivery in early January 2019. Happy Christmas to all our customers! On top of BeeRaider’s usual sales we continue to see increasing sales of our keyboards for use as one handed keyboards. Users are now seeing the many benefits that our keyboards have to offer those who need a one handed keyboard, whether because of hand injury or other conditions involving hand impairment. The main-key-cluster of our keyboards is compact while offering much larger keys in an ergonomic layout. Our Optimized keyboard layout is also designed to minimize hand and finger travel thereby further reducing data-entry time while also helping to prevent or ameliorate repetitive strain injuries (RSI). These injuries are especially prevalent among those who code for a living. Our keyboards are also considerably less expensive than other competitor keyboards targeting one hand keyboard users and are now on special discount offer. If you’re looking for a one handed keyboard then we firmly believe that our wireless keyboard products offer many beneficial features to those who for whatever reason choose to use only one hand when typing. Besides able-bodied users, we are happy to see more of our keyboard sales going to a range of users with movement impairments. These would include for example users with carpal tunnel injuries, Parkinson’s and Cerebral Palsy. BeeRaider’s 2018 New Year Sale is now in progress. Visit our website (http://www.beeraider.com) to avail of our biggest discount yet on all our wireless keyboard products before this great offer ends. Here’s wishing all our customers a very happy and prosperous New Year! BeeRaider’s recent attendance at Dublin Tech-Summit 2017 proved to be a great experience with big interest shown in our wireless keyboard products by the many attendees at BeeRaider’s show stand. Media interest in BeeRaider was also high and we even managed to make the prime-time 6pm national news (RTE news). This gets BeeRaider off to a great start in 2017 and we’re now eagerly looking forward to the next chapter in our developing story. BeeRaider is pleased to announce that its application to appear in Dublin Tech-Summit 2017 has been successful and the company will be one of a select number of startups exhibiting at the show on the 15th-16th of February 2017. If you’re planning on going to the show we’re looking forward to meeting you there! We’re now starting to receive feedback from some of our early adopters and the sample comments included below show what they have to say. Here’s some emailed comments from Eduardo in Brazil (Fin-tech programmer), who purchased an Optimized keyboard from us. When I’m not coding, I type in Brazilian Portuguese, and the accentuation keys are very well distributed, making the typing very fluent, even in non-English languages. I’m using the keyboard at work and a friend of mine has already ordered a combo set to use here as well (confirmed). Some other friends are planning to do so. Here’s another from Diego, USA (A processes architect/consultant with Dell) who also bought an Optimized keyboard from us. Thank you for all the follow up; I am very happy and proud to be part of the future of typing you just started. Here’s another from Nick, Australia (writer) who also bought an Optimized keyboard from us. BeeRaider is pleased to announce that it has now launched its two new wireless keyboard and mouse combo-set products, which are intended primarily for use with WinTel devices. The products are presently available solely from our website and the prices include worldwide delivery. Our new wireless keyboard and mouse combo-set products have finally arrived and are available now for purchase exclusively on our website. Our new products are on the way. Be sure to place your order early if you want to grab one of the first 1,000 uniquely marked units and stay tuned! A big thank you to those who have placed pre-orders with us. We continue to make progress with the project having incorporated several design improvements, which we feel certain will improve both the performance and look of the product. Stay tuned for our news bulletins. A BeeRaider products E-Brochure is now available for download here. A new training video for BeeRaider’s Optimised Radial Keyboard layout is now available from our website’s ‘Training’ page. This video teaches users how to memorise the alpha-characters layout of our Optimised Radial Keyboard in approximately 10 to 20 minutes. Once memorised a user then needs to train their finger-muscle-memory in order to see their typing speed begin to rapidly increase. This will happen over a three to seven day period of continuous use. CES 2015 ended today. Attending the show has been a first time experience for BeeRaider and the level of interest shown by attendees in BeeRaider’s products has exceeded all expectations. BeeRaider presented two keyboard prototypes at the show and managed to garner considerable interest across a range of industry segments. Coinciding with its first day of attendance at CES 2015 in Las Vegas, BeeRaider today launched its brand new website allowing for pre-ordering of its first two physical keyboards, which it aims to manufacture and bring to market in quarter-two 2015. Full product details are available from the Products page on our website. Our plans to bring a second product to market are now well in progress. As part of our 2015 pre-launch activities we are booked to attend the CES International 2015 exhibition in Las Vegas in early January 2015. We’re happy to report that our application was accepted by CES and that we will be appearing in the show’s ‘Eureka Park’ section, which is reserved for start-ups with innovative products. If you are planning on attending the show, then please be sure to visit us at booth number 75339, where we will be showing our first physical keyboard product. Thanks for all your feedback. We are preparing plans to bring a second product to market and will keep you informed of progress. A new Demo/Tutorial video has now been uploaded to YouTube. This 12 minute video covers all aspects of the Android Radial Keyboard App and it replaces the previous (silent) Demo video. Click on the relevant home-page link to view this video. 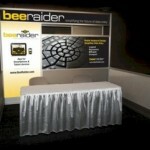 BeeRaider made its debut at the recent CEALinesShow in New York City, which was held in the last week of June this year. BeeRaider’s invitation to appear in the show’s special ‘Innovation Zone’ was especially satisfying as the company had only just launched their first product earlier in March. We are delighted to report that our radical new Radial Keyboard design was extremely well received by the show’s attendees who consisted of trade only. BeeRaider has updated the ‘Home’ page of its website with a new video explaining various design aspects of its Radial Keyboard. We are excited at having finally launched our very first product in the form of our Android soft-keyboard App. We have no intention however of letting it be our last though, as the positive feedback we’ve received to date regarding our unique new Radial keyboard design has been more than heartening. Apart from the possibility of targeting other platforms with our soft-keyboard App, we are also now seriously considering bringing a physical keyboard design to market. To this end we’d like to hear from you, so that we can start even at this early stage, to gauge what interest there might be out there. So if you wish to comment, please drop us a message through our Contact page.